Many believe, social media marketing is done through blogposts, videos, photos and RSS feeds. But hardly few understand the potential of sharing online PowerPoint slide slows in video form. Just imagine you want to share the PowerPoint slideshow to millions. Then, using PowerPoint presentation in video format is an appropriate tool. AuthorStream’s brand new feature allows users the ability to convert PowerPoint files into videos. So, what are the steps you need to convert PowerPoint files into a video format? You can upload these PowerPoint video files to YouTube or transfer them to your iPod and watch them on the move. Or you can burn the video on to a DVD and watch the presentations on a large TV screen. To get started, all you need is a copy of Microsoft PowerPoint (XP, 2003, 2007), the PPT file, a webcam or microphone (if you want to record audio) and Internet access. Step 2: Now go to authorstream.com and upload the PPT file you saved in Step 1. 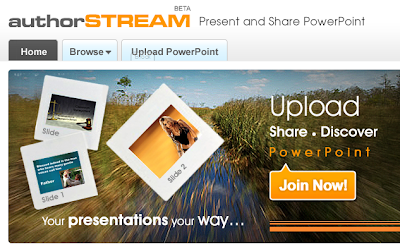 AuthorStream is a PowerPoint hosting service where you can PPT files as large as 1 GB. There is more - other than converting PPT to video, AuthorStream will also create a video podcast version of your presentation that can be directly imported into iTunes. This could a good opportunity for educators who have piles of PPT files on their computer that can be shared with the world. AuthorStream is a user generated presentation site that empowers the author to reach its viewers directly. AuthorStream provides the facility to view a presentation to the viewer even without having PowerPoint on the system. AuthorStream is a great online community that gives access to numerous presentations on varied subjects uploaded by community members. The site has already registered 8 lakhs views per month in just seven months of its introduction. The total number of presentations uploaded on AuthorStream is growing exponentially with people from all kinds of background finding ways to use AuthorStream for information sharing. One can find exciting presentations on just about any topic, rate them, post a comment and even download them in video format which can then be played on iPods or shared further through video sharing sites such as YouTube.